Halifax coach Richard Marshall reflected a more optimistic mood around the Shay ahead of the Championship opener against Featherstone after watching his side lose 13-6 to Super League partnership club Salford on Sunday. 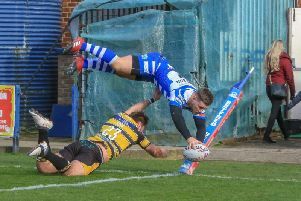 Because while Fax closed out their warm up games with a third straight defeat, after heavy losses to Featherstone and Widnes, a near full-strength side showed far more spark against an equally high quality Red Devils line up. “I thought we improved quite a lot in that game,” said Marshall, who rested forwards Jacob Fairbank and Ryan Boyle due to injury. “We defended well and limited their chances, although they score what you’d probably call a couple of soft-ish tries. “We were better with the ball, broke the line a few times and could have scored a few more tries. “Our discipline was much improved and our game management was good. “We were conceding a lot of tries last year and we’ve concentrated on our defence and really going back to basics with that. “When you’ve a limited amount of time, sometimes that is to the slight detriment of something else, but when we get those combinations going we’ll get a bit more fluidity there. “I liked Connor Robinson at full back, he got banged early on but I thought he was tough and composed. “I’ve not settled on the half backs in my own mind yet, but we’ve got two weeks of training to look at our options in that area. The returning Simon Grix, making his first start of the year in the back row, and centre Ben Heaton transformed Fax’s frail right side, offering a threat with the ball and snuffing out the threat of former Kiwi centre Junior Sau. Grix was withdrawn at the break, while captain Scott Murrell also left the fray shortly after half time. “Both Scott and Simon and were planned substitutions,” confirmed Marshall, who also got a first hand look at the potential talent available to him under the two clubs’ dual-registration deal. “We know what they can do and although they probably wanted to stay on the field this was not a game that will have any bearing on our season. “The game against Featherstone in a fortnight is the important one. Marshall’s only significant injury concern was seeing his two hookers - Ben Kaye and Brandon Moore - both pick up what he will hope are relatively minor complaints with the opening day showdown with Rovers just a fortnight away.